As we reported earlier, Prime Minister Narendra Modi will be inaugurating the Digital India programme on 1st July 2015 at Indira Gandhi Stadium, New Delhi. During the inauguration ceremony, Prime Minister Narendra Modi will be launching various e-services like Digital Locker, e-education and e-health etc. The official logo for the Digital India programme also will be published in the event. The 'DIGILocker' - digital locker services would enable Indian citizens to store all kinds of “government issued” documents such as PAN card, Passport, Aadhar and Degree certificates online securely. Digital Locker Services are operated and maintained by the Department of Electronics & Information Technology of the Ministry of Communications & IT. To Sign-up for the Digilocker you need to have a valid Aadhaar number. Each user will be able to avail a maximum of 10MB space to store their documents in the DIGILocker. Once the Aadhaar number has been entered, a one-time password (OTP) will be sent to your registered mobile number to initiate the first log-in. After that, users would be able to set their own passwords. Digital Locker will provide secure access to government-issued documents. It uses authenticity services provided by Aadhaar. Digital Locker is aimed at eliminating the use of physical documents and enables sharing of verified electronic documents across government agencies. 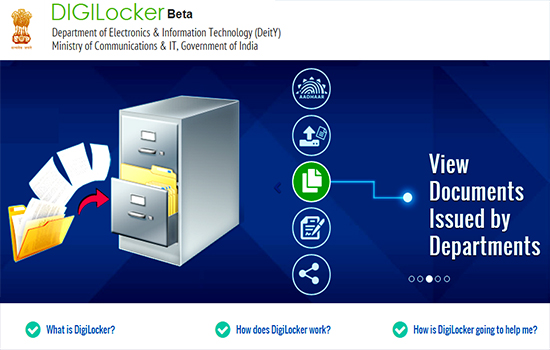 Digital Locker provides a dedicated personal e-storage space to citizens, linked to their Aadhaar numbers. Digital Locker will reduce the administrative overheads of government departments and agencies created due to paper work. It will also make it easy for Indian citizens to receive services by saving time and effort as their documents will now be available anytime, anywhere and can be shared electronically. DigiLocker can be used to securely store e-documents as well as store Uniform Resource Identifier (URI) link of e-documents issued by various issuer departments. To sign up for your Digital Locker, you need your Aadhaar number and a mobile number linked to that Aadhaar number. The government is also launching an e-Signature service with DIGILocker. The e-Sign facility can be used to digitally sign e-documents. Digital India is an umbrella programme covering many departments and this will transform India to a Digitally empowered society and knowledge economy. Dear readers, please share your views and opinions about the new DIGILocker Services by Narendra Modi government via comments with us.